This page is about the city in Saskatchewan, Canada. For other uses, see Estevan (disambiguation). The first settlers in what was to become Estevan arrived in 1892, along with the expansion of the Canadian Pacific Railway. It was incorporated as a village in 1899, and later became a town in 1906. 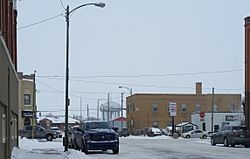 On March 1, 1957, Estevan acquired the status of a city, which, in Saskatchewan terms, is any community of 5,000 or more. The name origin is attributed to George Stephen's Registered Telegraphic Address, Estevan. George Stephen was the first President of the Canadian Pacific Railway from 1881 to 1888. On December 22, 1915, the 152nd (Weyburn-Estevan) Battalion, CEF was authorised and recruited men from the area before departing to Great Britain on October 3, 1916. Estevan was the site of the notorious Estevan Riot in 1931. Although most of the strikers were from nearby Bienfait, the strike is associated with Estevan because it was in this city the demonstrators were met by members of the Royal Canadian Mounted Police. After the subsequent riot, which lasted 45 minutes, three strikers lay dead. It was later proven the three miners had been killed by the RCMP. The miners had been organized by the Workers' Unity League. To help celebrate the centenary of settlement in the Estevan area, the Estevan History Book Committee published a handsome, two-volume history of the city entitled A Tale that is Told in 1981. The two volumes present a detailed history of the city and the surrounding area, including information about early pioneers, homesteaders, railroads, churches, schools, and businesses. The city of Estevan has two museums, one of which is primarily a gallery. The Estevan Art Gallery and Museum, formerly the Estevan National Exhibition Centre, was founded in 1978. The Estevan Art Gallery is a free public gallery that showcases contemporary art. The Galleries permanent collection includes woodblock-print works by Andrew King. The Estevan Art Gallery and Museum, EAGM, also features the North West Mounted Police Wood End Post Historical Site, NWMP Museum. This museum is in a house which is the oldest-known North West Mounted Police Detachment Post in Saskatchewan and holds a collection related to the North West Mounted Police and the 1874 March West from Roche Percee to Estevan. The Souris Valley Museum, SVM, is a local and regional history museum focused on human development and daily life within Southeast Saskatchewan. It was founded in 2001, primarily from the collection of Stan Durr. The museum provides an engaging depiction of the social and cultural influences and economic development of Southeast Saskatchewan. The collection includes the Schneller Schoolhouse, a Threshing Cook Car, a Homesteader Shack, two of Estevan's original Firetrucks and a Heritage Mining Display. The Estevan Arts Council, founded in 1967, is a non-profit organisation that offers art classes and workshops, adjudicates art shows, hosts concerts and provides a youth art scholarships through the work of volunteers and community donations and grants. 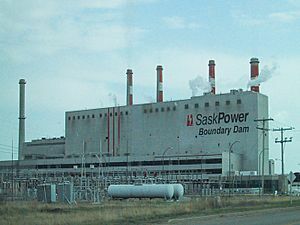 SaskPower Boundary Dam Power Station one of two coal fired generating stations in Estevan. Estevan has a humid continental climate (Köppen climate classification Dfb) It falls into the NRC Plant Hardiness Zone 4a. Estavan climates is characterized by cold, long and dry winters and warm, short and relatively humid summers. The mean temperature in January, the coldest month, is −13.7 °C (7.3 °F). The precipitation in winter is chiefly snow, averaging 56.0 cm (22.05 in). The spring is a short transitional season, with a mean temperature of 4.4 °C (39.9 °F) and 107.3 mm (4.22 in) of precipitation, with significant snowfall in April. The summer is usually warm (the mean average high temperature is 25.3 °C (77.5 °F) (average high in July, the warmest month, is 26.5 °C (79.7 °F) and humid (190.8 mm (7.51 in) of total precipitation). Autumn, as spring, is transitional, being warm in September and cooler in October and November. At this time of the year, the average temperature is 4.6 °C (40.3 °F) and the total precipitation is 85.9 mm (3.38 in). Estevan is the sunniest city year-round in Canada, and it is also the city with the clearest skies year round in Canada. The highest temperature ever recorded in Estevan was 43.3 °C (110 °F) on 5 July 1936, and 5 July 1937. The coldest temperature ever recorded was −46.7 °C (−52 °F) on 11 January 1916, and 16 February 1936. Estevan Facts for Kids. Kiddle Encyclopedia.